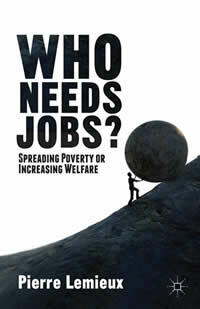 My new book, Who Needs Jobs? Spreading Poverty or Increasing Welfare, is just out at Palgrave Macmillan. In this book, I explain why jobs are costs, not benefits; and why, consequently, we need as few of them as possible. I also explain the economic concepts necessary to understand this (rather standard) economic result, so the book is accessible to the lay reader. It may even be considered as an introduction to the economic way of thinking. You can order the book from Amazon.com, from Palgrave Macmillan, or from your favorite brick-and-mortar library. Perhaps after reading it you will want to leave a comment on Amazon? Ducan Black (1908-1991) was an economist who made important discoveries in the theory of elections: the median-voter theorem and, rediscovered after Condorcet, the paradox of voting. Charles Dodgson (1832-1898), a.k.a. Lewis Carroll, was a mathematician who explored the same field, although he is better known for his literary work, mainly Alice’s Adventures in Wonderland. I cannot get excited against air strikes on 7th-century violent barbarians persecuting civilian populations. However, I believe any supporter of liberty must get excited against Barack Obama when he says: “I don’t want to get in the business … of being the Kurdish air force.” (Financial Times, August 9, 2014). Who does he think he is? Does he think he is an airforce? The conceit of rulers, so-called democratic, is despicable, but alas symptomatic of their power.